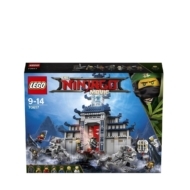 - Includes 7 minifigures: Kai, Nya, Cole, Zane, Lloyd, Jay and Jungle Garmadon (with 4 arms and new-for-August-2017 jungle outfit decoration) and 2 buildable temple guardian figures. - Features large main entrance doors, trapdoor, rock-dropping and dynamite-dropping functions, dungeon with secret entrance/escape route, library with a scroll and hidden blade-shooter (shoots discs with blade decoration), room with gold-colored sword and chopping-sword trap, storage room with a sword and buildable vase, 2 attic rooms, a hanging cage that fits a minifigure inside, beacon with translucent-blue flame-style element, pull-out section with poles for minifigures to leap between to get to the treasure chest, statue, plus assorted elements including a skeleton, spider and 2 snakes. - Release the rock to knock over a minifigure and then turn the dial to pull up the chain ready to drop it again! - Press the lever to open the dungeon's secret entrance/escape route. - Activate the hidden blade shooter under the scroll to topple a minifigure. - Turn the dial to bring down the chopping sword and knock over a minifigure. 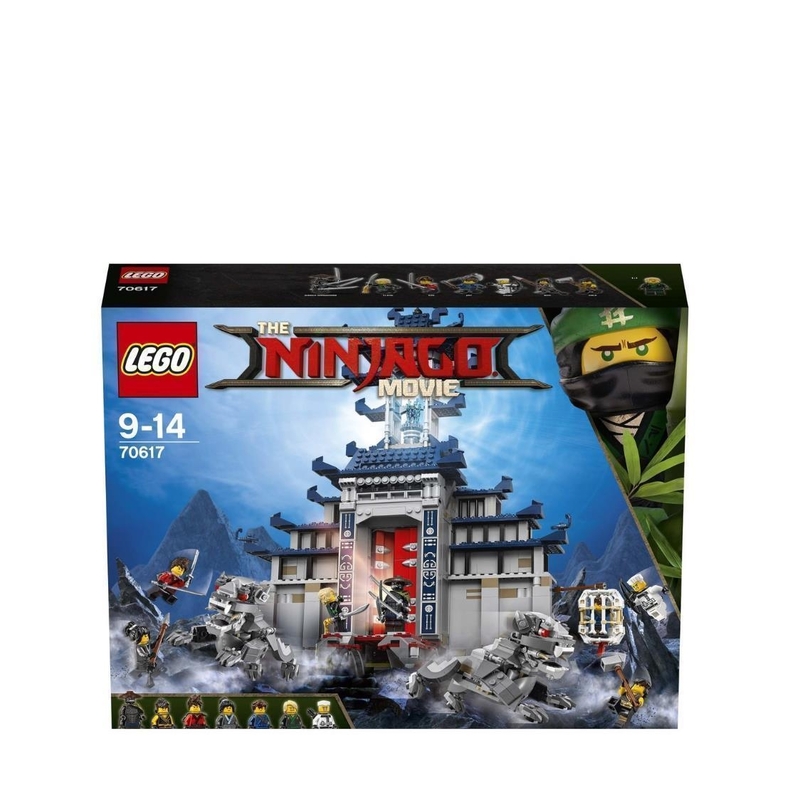 - Weapons include Kai’s 2 katanas, Nya’s tasseled spear, Cole’s hammer, Zane’s bow and arrow, Lloyd’s Chinese tasseled sword, Jay's chain with spike and Jungle Garmadon's 4 swords. - Accessory elements include Kai's sword holster and Zane's quiver. 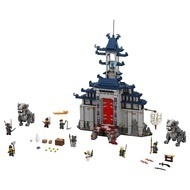 - Recreate and role-play exciting THE LEGO® NINJAGO® MOVIE™ scenes. - Temple of The Ultimate Ultimate Weapon measures over 19” (49cm) high, 14” (38cm) wide and 11” (28cm) deep. - Temple guardians each stand over 3” (10cm) tall.